This chapter looks at cash flow methods in property investment appraisals. Cash flows into the future are forecasts, but valuations and forecasts are fundamentally different. This aspect has been discussed to a degree in Chapter 5, but essentially the valuation is about market price as a snapshot in time. It may be based on assumptions as to what will happen in the future but it is not a forecast A forecast will be concerned entirely with the future. In development appraisals assumptions need to be made about project costs and future rents, and potential changes can be incorporated. Formal forecasting is used in property development, but its overall lack of use is based on the problems of risk and uncertainty in the development process (Schiller 1994). Cash flow approaches are aided by computers, and the use of spreadsheets for calculations involving cash flow statements is vital. Some texts suggest the use of bespoke computer programs (Darlow 1988); these bespoke programs can examine the answers relating to changes of inputs into the calculations, but it is difficult to examine the changes in detail as they occur, and for this a spreadsheet is more useful. 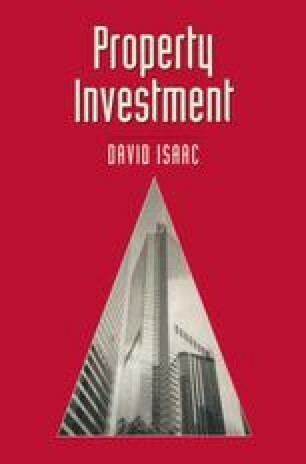 The computer spreadsheet is a useful tool for investment appraisals and the examples in this book have been calculated using this software.